Some people have filled a couple of rooms with furniture made from wooden pallets, such as a pallet desk, pallet armchair and pallet bed base. However, others have taken it much further. In fact, they’ve elevated it into an art form. Indian architects Mofa Studio recently won an award for a large-scale sculpture made almost entirely from gracefully stacked wooden pallets – over a thousand of them. The inspiration for the sweeping curved outline of the building was taken from the intricate lines of many of India’s ancient and often asymmetric carved buildings, but the simplicity of it was said by the designers to evoke the uncomplicated perceptions of childhood, and the guiding intention was to facilitate contemplation. This wooden pallet structure, “a parametrized stacking of shipping pallets” in the words of its designers, was situated in the outskirts of New Delhi and was partially covered with compost and grass to harmonise it with its environment. The 800-square-foot enclosed area was used as an exhibition space, and in it there was some solar-powered pieces of furniture that would light up when people sat on them. Mofa explained that “the concept initiated from the basic idea of ‘fluid’ thoughts,” and this led to their naming it “The Ponseive” after the magic basin of memories in Professor Dumbledore’s study in Harry Potter. Inspiration is said to have been drawn from playing amongst the ruins of ancient buildings as a child. Even though the installation was left up for only a short space of time during 2014, it has continued to accumulate awards – even after it was disassembled. Kohler, the plumbing design company, perhaps liking the association with magic basins, nominated it for the Bold Design Awards of 2016 in the Community Harmony category. Similar temporary art installations have also been erected in many other parts of the world, including Nottingham Castle, but not on such a grand scale. If you prefer your pallets just a bit more down to earth, how about the pallet housing project proposed by I-Beam Design. Prince Charles’ Royal Gardens recently hosted a pallet home in an exhibition on sustainable design. The designer had already promoted similar structures as a possible solution to the problem of housing refugees, suggesting that with one and half years’ worth of America’s current pallet production 33 million refugees could live in a pallet house. And with just the ones sent to landfill each year 40 thousand refugees could be housed. In fact, it seems a small pallet village has actually been assembled for Somali refugees. 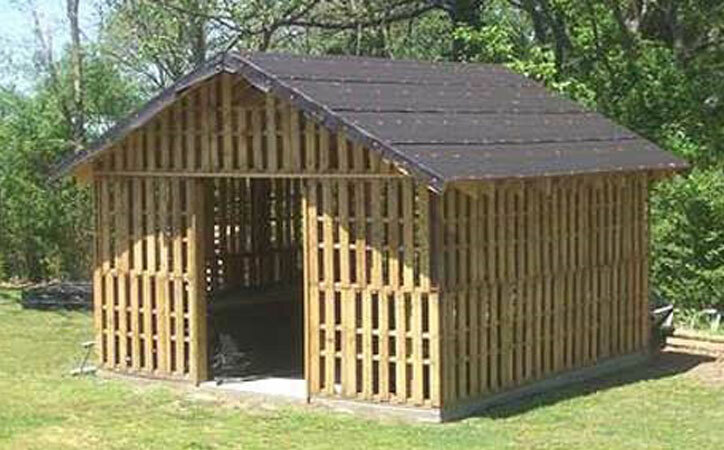 Each pallet house requires approximately 100 pallets. The design is available from the I-Beam website for about $85. Polish design studio Mode:Lina Architekci, who specialise in builds using recycled materials, have also recently built a wine shop in Poznań and furnished it using pallets, while the offices of Dutch advertising agency Brandbase have recently been refitted with furnishings constructed from 270 shipping pallets. Even a design for building a pallet swimming pool is available online from the “DIY & Crafts” website. If your business is heavily dependent on pallets, you’d probably be well advised to keep a close eye on them all.